Neue Nachrichten bitte immer ganz unten einfügen! Here in Bogotá, a new gondola lift system opened a couple of months ago. The corridor can be seen in the Transmilenio map you made, near Portal del Tunal. I think it would be nice if you added this new line. It's called the T line - Ciudad Bolívar, its HTML color is #D9E543, and it has three stations, their names and locations can be seen on Openstreetmap (the one called Paraíso is actually called Mirador del Paraíso). I think that given your criteria for highlighting a station as a "Estación de intercambio", the station called Escuela Militar on the D line could also be considered an "Estación de intercambio", as it connects with the C line and the G line directly. And lastly, three stations changed their names. Cardio Infantil, on the B line, is now called Calle 161. Profamilia, on the A line, is now called Calle 34. Hospitales, on the L line, is now called San Bernardo. Hello Chumwa! I firstly want to let you know how impressed I am with all of your maps. In particular, I am aware that you have made many maps relating to rail transport in Turkey. Actually, I discovered you from your maps on the article for Public transport in Istanbul, which I think are amazing and creative. I understand that you enjoy making these maps when you have the time, so I was wondering if you would be interested in creating a similar public transportation map for Izmir that combines its ferry, metro, IZBAN (S-Bahn-like light/commuter rail), and tram lines into a single map. This would be highly useful considering how quickly the system has been expanding and how the newly elected mayor has stated that improving it one of his priorities. 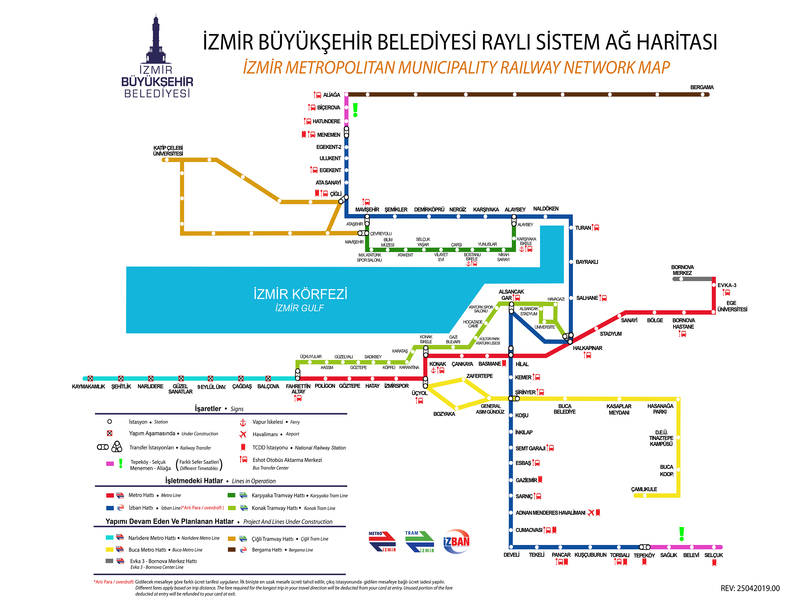 You may find this map and this map helpful as a starting point, though a few things to keep in mind that these maps do not include are 1) the stations located at/near ferry ports and/or the ferry lines between them 2) the long-awaited Halkapınar-Otogar line of the Izmir Metro which is planned to have 4 new stations, and 3) the high speed train (YHT) link to Ankara from Halkapınar currently under development. Hopefully this has minimized some of the research needed on your part. It would be so great to have a user-contributed map that can be easily updatable as new plans and information comes in. Let me know if this interests you! Die von dir erstellten Karten für die Bremer Tram haben mehrere Jahre keine Aktualisierung mehr gesehen. Die Hinzufügung der neuen Linie 5 wäre Anlass, alle Karten an den aktuellen Stand anzupassen. Beim Liniennetzplan müsste nur die 5 hinzugefügt werden. Sie beginnt in Gröpelingen und fährt als 5S bis Waller Ring (mit Halt nur in Use Akschen), dann über Eduard-Schopf-Allee und Falkenstraße zum Hauptbahnhof, von dort zum Bürgerpark. Die anderen beiden Karten müssten noch weiter aktualisiert werden, da die Linien 1S und 4S von Osten nur bis Kirchbachstr. führen und die 3S nicht mehr betrieben wird. Diese Seite wurde zuletzt am 18. April 2019 um 13:54 Uhr bearbeitet.